I met Brandy at Taylor Lane for our Monday writing session. 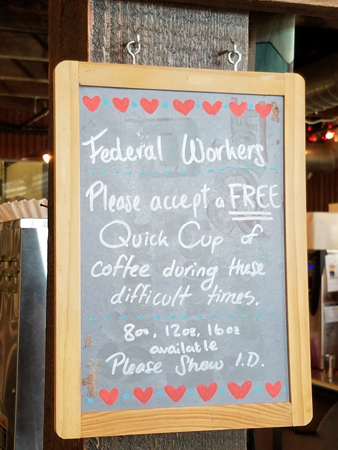 Taylor Lane Coffee offered unpaid government workers a free cup of coffee during President Trump’s shutdown of services. 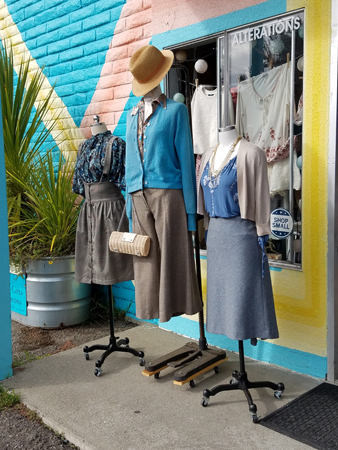 It’s just another way this local business shows itself as part of a community. We walked over to the store after that. A flock of crows, probably twelve or fifteen, lifted off from the courtyard of the invisible hotel and flew toward the Rialto Cinemas across the street. I cleaned and shelved 15 books by Alexander McCall Smith. Most of them went into the Mystery section, but I put four on the New Arrivals shelf. I am the most familiar with the fiction alcove of the store. The Art section is a virtual wilderness to me, so my plan for 2019 is to get more familiar with it and with some of the smaller nonfiction sections. I’m pretty good in the Psychology, Philosophy and Western Religion sections, but Biography is nearly unknown. I’m slightly better than adequate in California and the West because I finished up the inventory for that one, which means I looked at each book and checked it off a list. None of the deficits are that serious, because every book is in the database, but it should help me make recommendations for similar types of books and help track down ones that are mis-shelved. Some mis-shelvings can be figured out, using a reverse-engineering Sherlock-Holmes-style method. A common one is a book whose author’s name starts with a K, for instance, in the middle of the shelf of Graham Green books. How did that happen? Probably, the book came originally from the shelf one bookcase over, where the Ks are shelved. Once in a while, though, a book migrates clear across the store! The other day I found a Clive Cussler adventure novel in the Children’s section. This means someone carried it all the way over there, perhaps planning to buy it, maybe just reading it as they meandered, changed their mind and put the book down wherever. If you don’t want to walk all the way back to the section you took a book from, you can just bring it to the counter. Someone will re-shelve it. 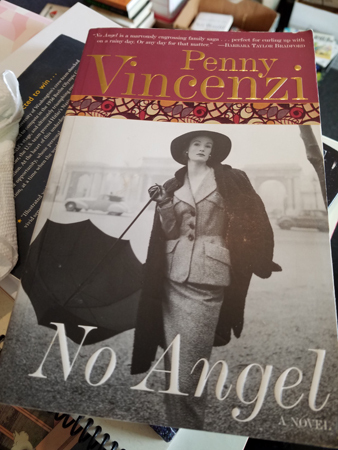 I don’t know if I would read Penny Vincenzi’s family saga, because it isn’t the kind of book I reach for, but I sure do love that cover. 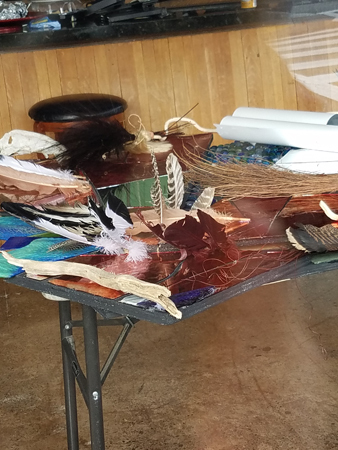 This arrangement covered a table in the lobby of the Main Street Theater. Is it a setting, or a set of props, from their current play? Or the next one? Inquiring minds want to know. 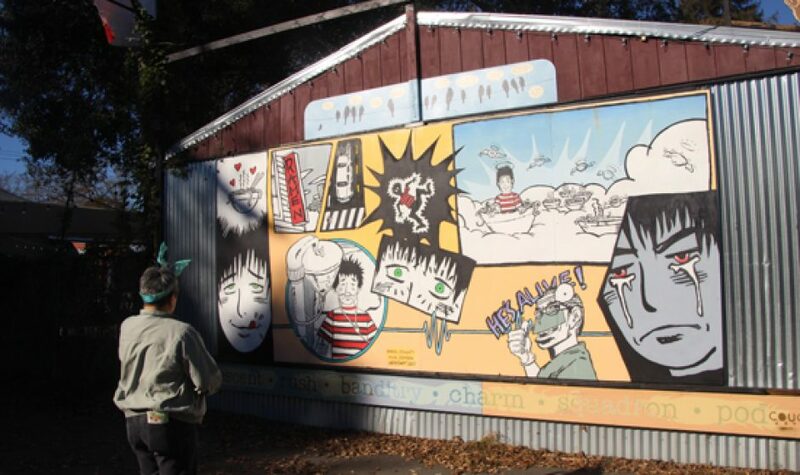 This entry was posted in Around Town, View from the Road and tagged Main Street Theater, Rennie Bird's, Taylor Lane, The Music Man. Bookmark the permalink.